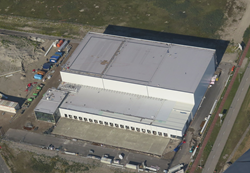 AGRO Merchants Greenfield cold storage facility at the Port of Rotterdam is now fully operational. AGRO Merchants Group completed its first phase of its much awaited Rotterdam-Maasvlakte facility, adding 18,000 pallets of frozen and chilled space to the market. The company began construction in February 2016 to expand its service offering to its client base in a critical port hub location. AGRO Merchants Rotterdam-Maasvlakte will provide comprehensive services for the meat and seafood industry and will also serve as a replacement Veterinary Border Inspection Point (BIP), which previously operated in Coldstore Wibaco, Barendrecht. Located in Rotterdam, the largest European port in throughput volume, the facility will benefit importers and exporters through AGRO’s global network and Captive Trade solution. With this innovative program, AGRO Merchants Group can take full responsibility of movement of meat products from origin to destination, including any re-handling, veterinary checks and inspections on both ends adds value and reliability to our customers. The state-of-art facility achieved a BREEAM Excellent rating for sustainability thanks to the environment-friendly designs, energy and water saving measures and the cooling system using natural refrigerants. BREEAM Excellent is the highest energy efficiency rating for this type of storage facilities in Europe. The project in Rotterdam-Maasvlakte follows other important investments in strategically located ports worldwide. AGRO’s recent expansion of frozen capacity in Algeciras, Spain is a key global shipping node in Southern Europe. Coldstore Urk, also part of AGRO Merchants Group, is one of the most important fish and seafood hubs in the Netherlands and Europe. Mullica Hill Cold Storage near the Port of Philadelphia, PA and Dean’s Services in Oakland, CA, both part of AGRO Merchants Group, are renown as some of the largest import/export hubs for protein products in the U.S. With the investment into a new warehouse in Rotterdam, AGRO continues to strengthen its leadership in the industry. AGRO Merchants Group owns and operates 56 facilities in 9 countries in Europe, North America, Latin America and Asia Pacific with more than 750,000 square meters of cold storage space. The company is focused on providing innovative cold chain solutions on a global basis by partnering with the highest quality family businesses and creating new, reliable, and integrated trade networks to help its customers grow. AGRO invests in modern assets, industry-leading technologies, and value-added service offerings to ensure the highest quality supply chain management standards in the industry. For additional information, please visit AGRO’s website at http://www.agromerchants.com.